RICHMOND, Va. (WRIC) — Brian Korte’s dining room table is his easel. “I am an artist, and my medium of choice is LEGO bricks,” he says, taking a break from his latest masterpiece. Korte found his calling as a LEGO artist by accident. The Information Technology (IT) professional by day needed a way to relax offline at night. After seeing a LEGO portrait, Korte first gave the special bricklaying a try in 2004. Each project starts with a digital design. Korte then fills in each pixel with LEGOS in every shade of the rainbow. Many of his pieces are memorial portraits. As Korte talks with 8News Anchor Amy Lacey, he puts together a picture of his father-in-law, beloved Richmond dentist Dr. Mike McMunn, who died unexpectedly last month. Korte is also a favorite of corporations worldwide. Some of his commissioned works include an 8×8 creation for an oncology conference that took a team working around the clock for four days to complete. What started as a hobby 13 years ago evolved into a full-time building career with a company he started called Brickworkz. Korte helps to preserve memories for people, and he says that is priceless. Korte will be featured at the Cultural Arts Center at Glen Allen in an exhibition called Vibrance, which will include a lot of color. 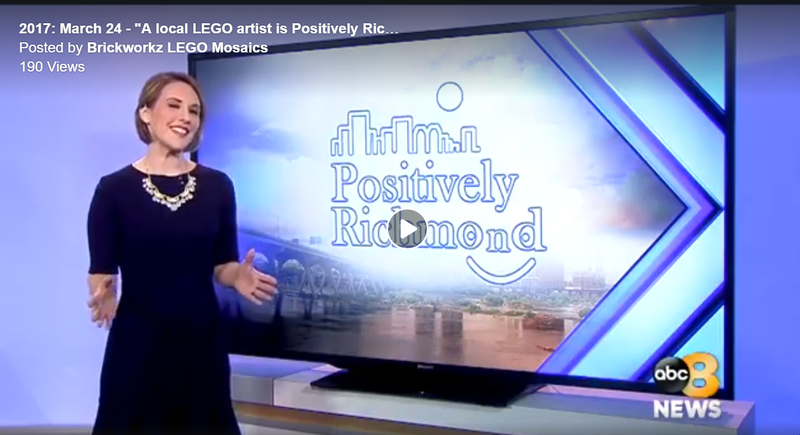 The free opening reception is March 30 from 6:00 p.m. until 9:00 p.m.
A local LEGO artist is Positively Richmond By Amy LaceyPublished: March 24, 2017, 11:01 amRICHMOND, Va. (WRIC) — Brian Korte’s dining room table is his easel.“I am an artist, and my medium of choice is LEGO bricks,” he says, taking a break from his latest masterpiece.Korte found his calling as a LEGO artist by accident. The Information Technology (IT) professional by day needed a way to relax offline at night.After seeing a LEGO portrait, Korte first gave the special bricklaying a try in 2004.“Typically people will see the portraits on the walls, and they don’t even realize it’s LEGO until they get closer,” he explains. “I love seeing that twist with people when they make that connection.”Each project starts with a digital design. Korte then fills in each pixel with LEGOS in every shade of the rainbow.Many of his pieces are memorial portraits.As Korte talks with 8News Anchor Amy Lacey, he puts together a picture of his father-in-law, beloved Richmond dentist Dr. Mike McMunn, who died unexpectedly last month.Korte is also a favorite of corporations worldwide. Some of his commissioned works include an 8×8 creation for an oncology conference that took a team working around the clock for four days to complete.“Coca-Cola commissioned me two weeks ago,” Korte adds. “We did big Slurpee statues out of LEGO.”What started as a hobby 13 years ago evolved into a full-time building career with a company he started called Brickworkz.“It helps me kind of tune out the world and think,” Korte explains. “I enjoy just putting in one piece at a time.”Korte helps to preserve memories for people, and he says that is priceless.“To be a part of that is an honor to me,” he says. “I just absolutely love it.”Korte will be featured at the Cultural Arts Center at Glen Allen in an exhibition called Vibrance, which will include a lot of color.The free opening reception is March 30 from 6:00 p.m. until 9:00 p.m.